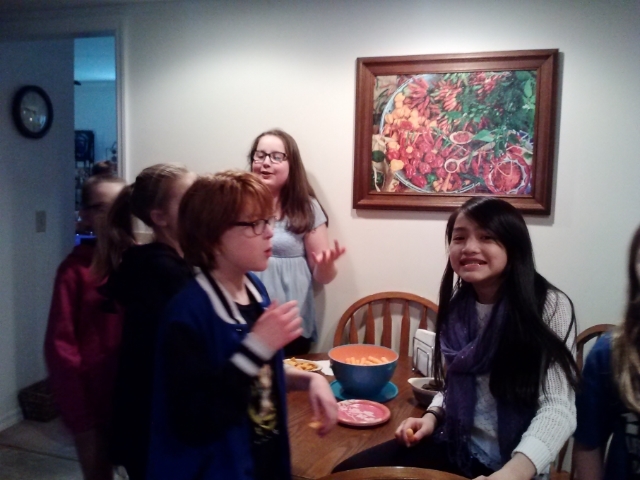 On a recent mild Saturday afternoon, a group of happy tweens arrived at our home to help my daughter celebrate her 12th birthday. They were full of energy and giggles right from the start! The birthday “Princess” was ready to greet her guests and make them feel welcome. For twenty minutes, we met girls and parents and exchanged pleasantries as one should. All went according to plan. That would be the last time I could say that with any real confidence! 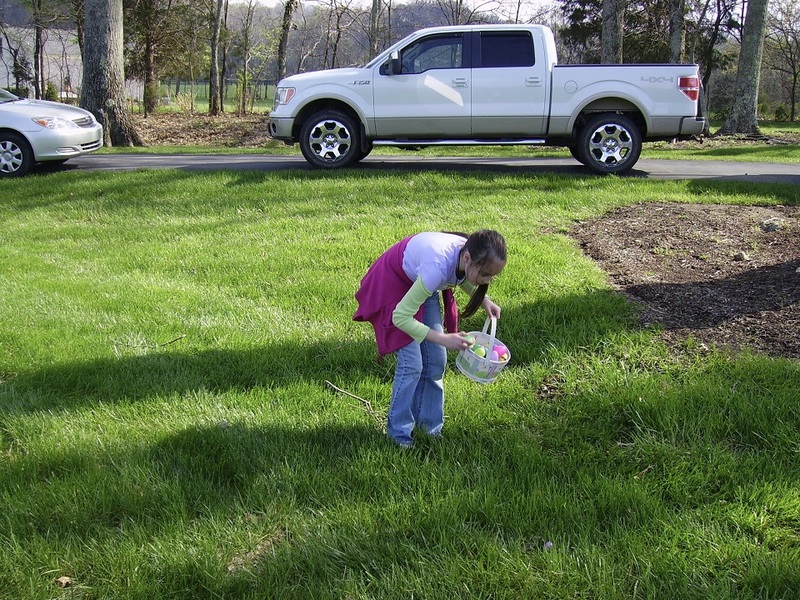 The great thing about tweens is their spontaneity! So my first tip to hosting an epic tween birthday party is: Plan to not follow your plan exactly. My next tip is to pick a theme that has a lot of wiggle room. While my daughter liked the “idea” of a Disney Villain style party, she didn’t want it to be over the top with decorations. We went with simple purple, green, gray and black pieces and accessories. The clear favorite was the villain banner! Hello Ursula, Maleficent and Darth Vader! After the girls had played outside for a while they came in ready for a snack. We had lots of on hand, but before I could get a photo to share- these girls descended upon the table with an appetite only a tween boy could rival! Which leads me to my next tween party tip: don’t take too many photos and never snap a picture of a girl with her mouth full of food! 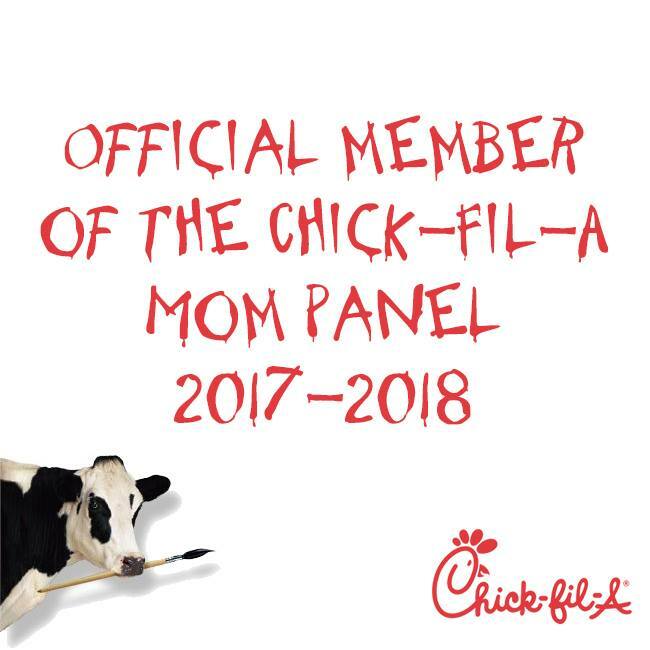 So, not cool Mom! After the girls hung out listening to music and taking selfies (yes, the irony isn’t lost on me) they went totally off plan and asked to do hair, nails and makeup instead of the crafts and games we had planned. Tip number 3: Roll with it, when at all possible. Here's my girls take on Maleficent nails. 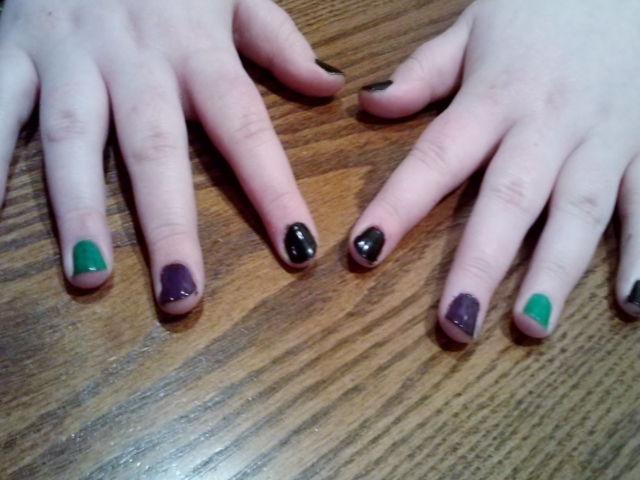 We used black, green and purple nail polish- but you could use whatever darker colors you have on hand. I think they turned out nice! 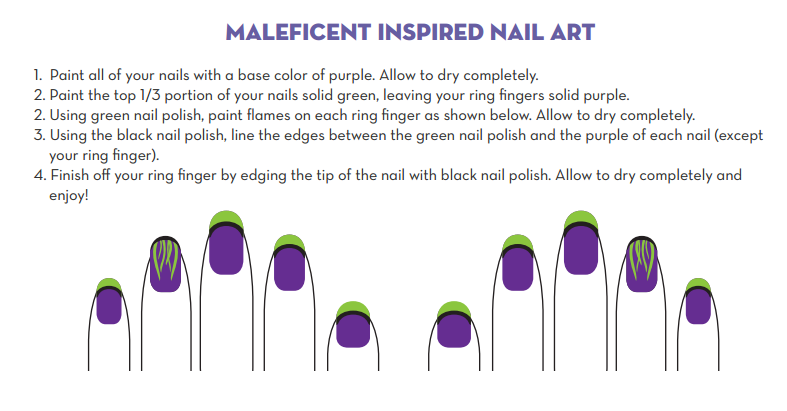 Want to create your own Maleficent Villain style nails? Here’s a quick tutorial for you to follow. 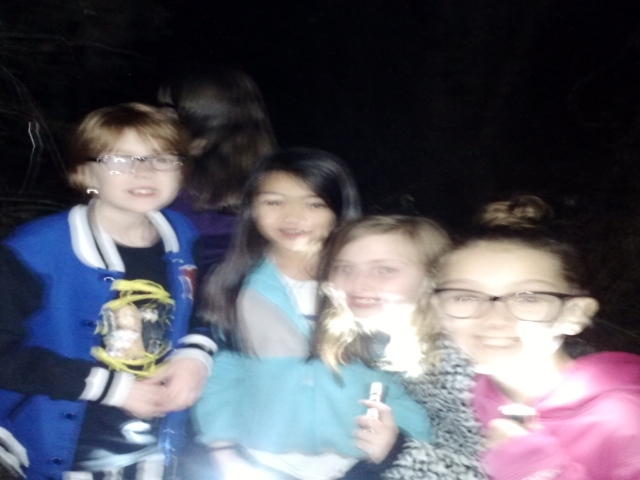 After dinner, which included lots of pizza and veggies, the girls were ready to be frightened by playing flashlight tag! Living out in the country like we do, Mother Nature provided us with a very dark and mysterious landscape, perfect to frighten and amaze city dwellers! Maleficent would approve! While down at our pond, these girls got themselves so scared, they ran back to the house and got us parents involved! 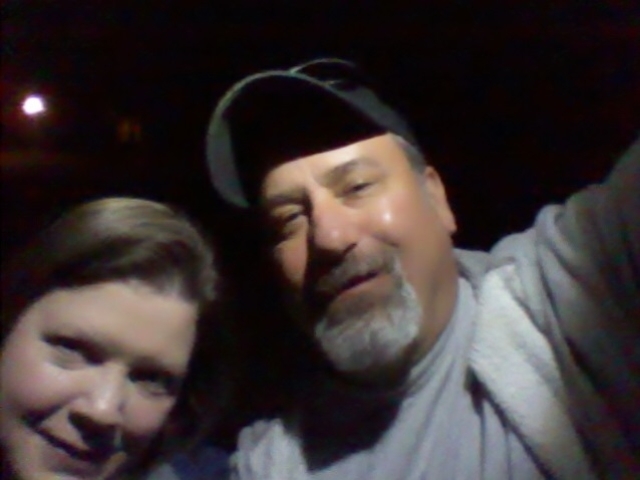 It was a perfect, crisp, clear night on our land for flashlight tag. Even with all the flood lights on there was much screaming and laughter. I must confess- this older Princess had a lot of fun outside with her Prince. 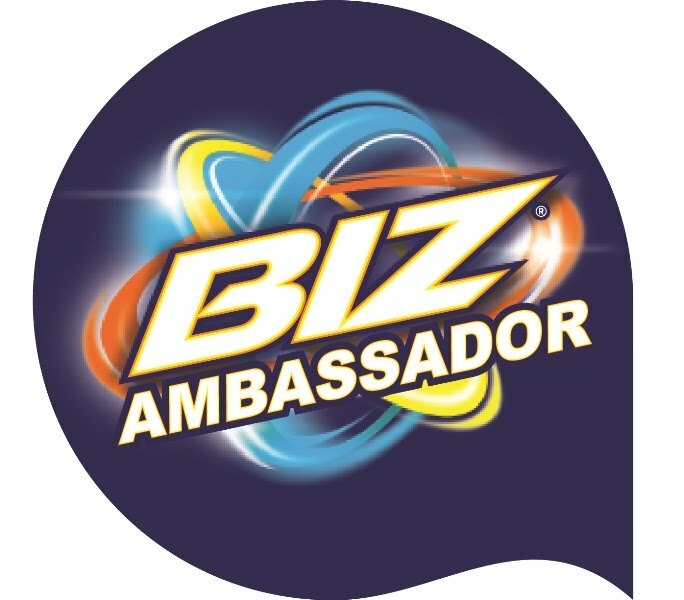 Tip number 4: Let your tweens explore and push the boundaries just a bit. Their party is the perfect time to allow ghost stories and playing outside after dark (weather permitting) as long as you establish safety guidelines first. Parents, even if you don’t want to be seen- stay close where you can hear and see the kids. Later that evening, the girls decided to get to the games and crafts part of our party plan. 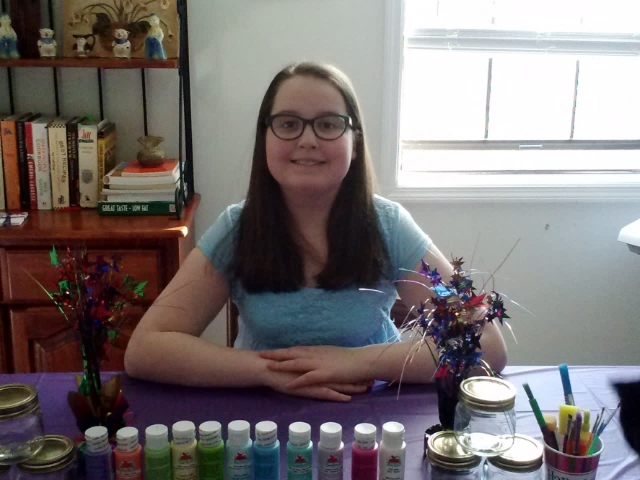 The clear favorite was the jar painting craft! They laughed and talked and joked and ate and laughed some more until it was movie time. 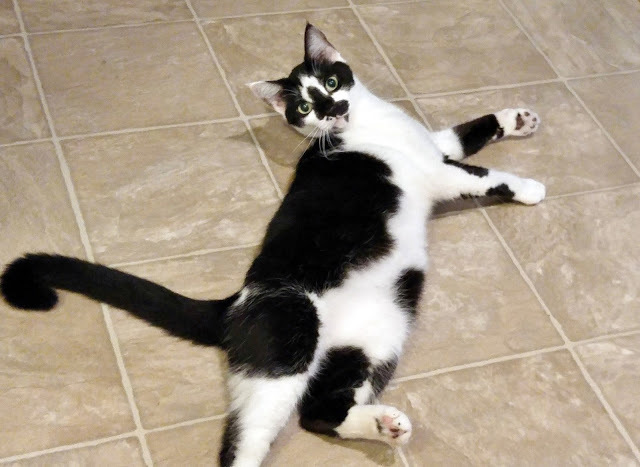 I cleaned up the happy mess as best I could and left the living room to them. Which leads me to tip number 5: let your child host, but set ground rules before guests arrive. 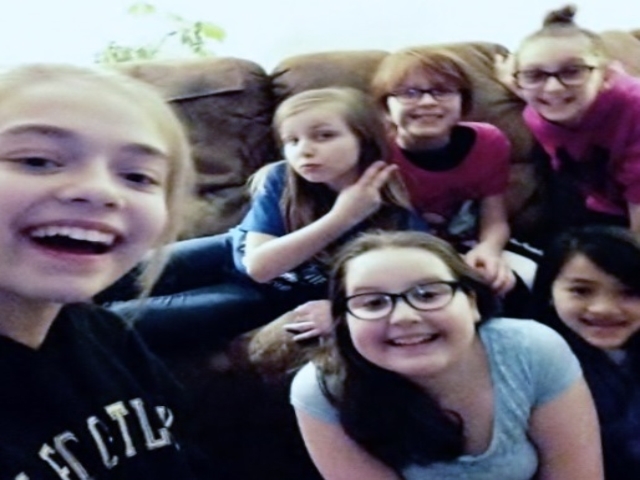 Chat with your son or daughter about snacks and drinks allowed, which movies are approved for watching and what time the party must wind down so kids can go to sleep if you are hosting a sleepover party like we did. 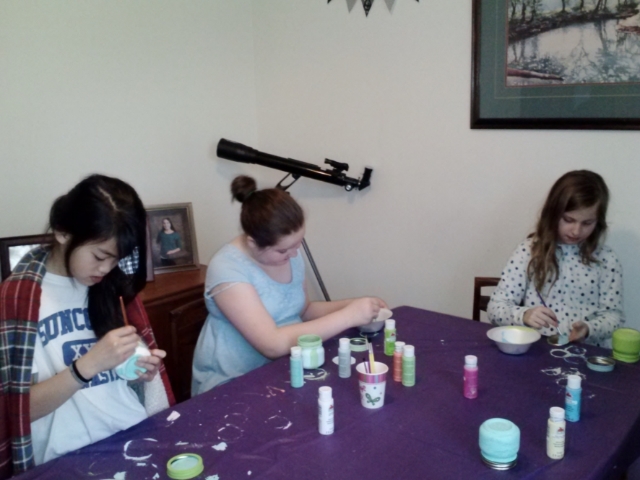 As I was preparing breakfast the next morning, the girls naturally gravitated back to the craft area to finish up their jars before pick up time arrived. 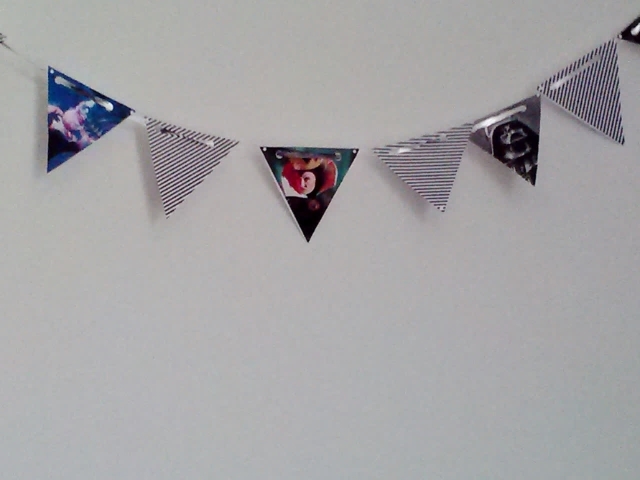 That's when I knew this craft project was a winner! 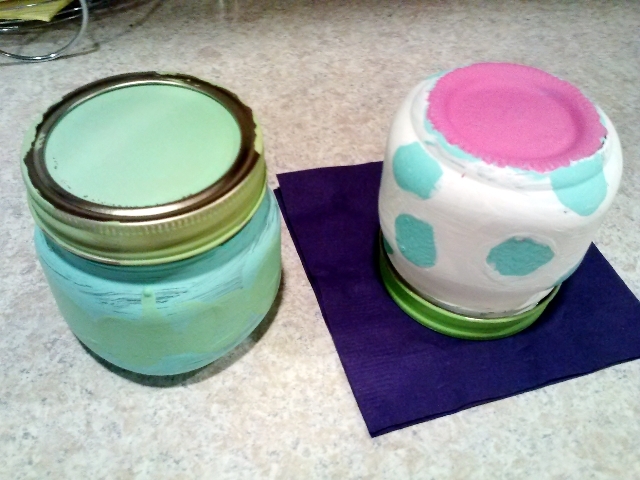 Even though this was a bit of a messy endeavor, I think all the jars turned out as pretty and as individual as the girls who painted them. 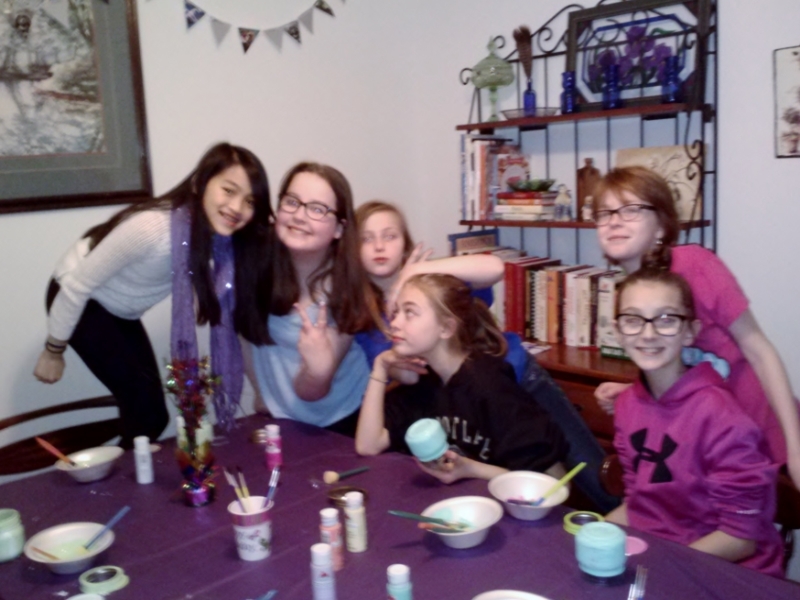 My last tip on throwing an epic tween birthday party, one in which your child and their friends tell you how much fun they had and how Epic! the party was. It's simple- sprinkle your party liberally with laughter and a healthy dose of pixie dust style patience and you too can pull off a great tween party! 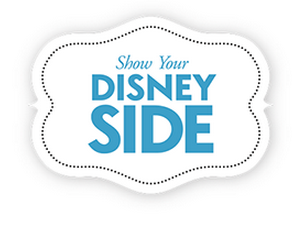 Disney wants you to show your #Disneyside by being happy and sharing what you love about Disney! Showing your Disneyside will look different for every family and that’s what makes life fun. If you’d like to throw your own #Disneyside at home celebration, head on over to DisneySide Celebrations and check out all the amazing themes, tips, activities and recipes they have. I'm betting you'll be able to pull of an epic party too! Please share in comments: What is your favorite Disney Villain character and why? 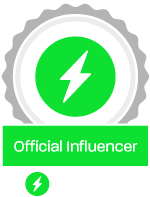 Disclosure: My thanks to Disneyside for providing us with a box of Villain worthy goodies to use how we chose to show our Disneyside. No compensation was given or wanted. We are happy to show our Disneyside as often as possible. Look at all those smiling faces! Easy to tell everyone had a great time! Love the Maleficent Villain style nail ideas, how fun! Will have to find some toddler-safe nail polish and do this with my grand daughter. 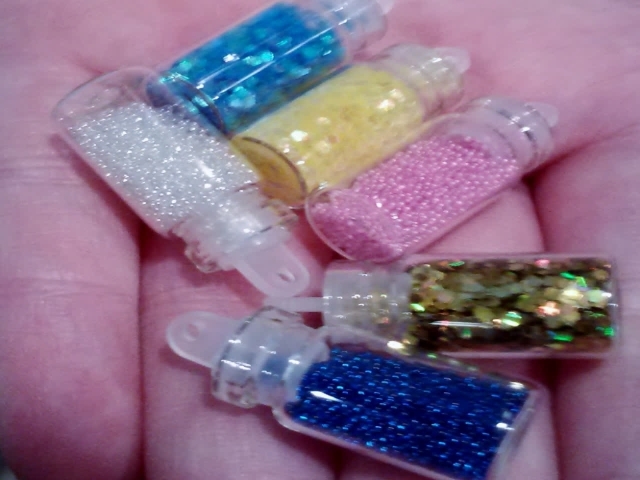 I hope you can find safe polish to do your grand daughters nails! Love the decor and the nails! My 6 year old daughter would have appreciated that as well. So much fun!